This beachy print hearkens back to the nuptial announcements of yesteryear. Perfect for a couple who commemorated their love on a favorite shore or a far flung island, this print captures the day the couple said "I do" amidst the whisper of the breeze, the gentle crash of waves, and the amber glow of a beach sunset. Chicago-based artist Alexander Doll sets scenes of wedded bliss in the context of classic print announcements that are as stunningly unique as they are timeless. 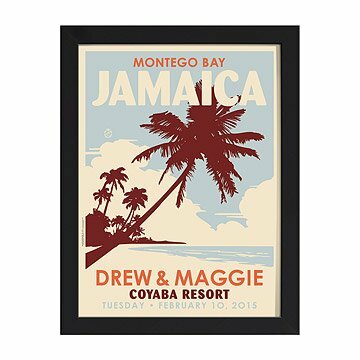 Capturing the sun, sand, and surf that made their day unforgettable, this nostalgic print hearkens back to the nuptial announcements of yesteryear with its sharp, sans serif typography, and hand-sketched illustration of the peaceful scenery. Alexander Doll incorporates personal details, such as the venue, date, and the couple's names. A sophisticated way to fete an unforgettable occasion, this inspired gift captures the couple's version of their fairytale while giving them a stylish and whimsical work of art to remember the thrill of the day with every passing glance. Printed on archival paper using archival pigment ink in Ohio. Arrives framed and ready to hang in black wood frame. Purchased for a friends destination wedding in Mexico. I didn't personally see it so I can't speak to the quality of the item but, they said they loved it. It is a unique gift that tells the recipient that you spent some time and effort looking for something personalized and unique. Bought this as a unique gift for my son and his wife to commemorate their beach wedding. They were thrilled! I'm so delighted that they were happy. LOVE this product! Perfect wedding gift. Bought this as a wedding gift for my husband, and it's beautiful hanging on our living room wall to commemorate our beach wedding!! I gave this to I husband for our first anniversary. It's great quality frame the back has hanging wire. The print is a great quality and I had extremely fast service it looks exactly how I thought it would be. Beautiful one of a kind gift. Something to be treasured forever. It was on the expensive side but it is a quality gift. Working directly through Uncommon Goods initially, assured the product would arrive as ordered. Couldn't be any happier with the end product.